For a traveler, traveling is the joie de vivre of life and the more they travel; more places are left for them to travel. It is a love saga that has no end and every place you end up in teaches you more about the world. If the world’s a stage, there are many plays occurring simultaneously at different parts of the world. For a traveler, nothing can be more pleasurable than partaking in these plays and getting to know about the various people and culture of the world. Traveling gives you an insight into the different lifestyle, society, and cultures and makes the whole world your neighbor. Broaden your horizons: Traveling makes you come across various cultural practices and social customs. A well-traveled individual would know about different places and their traditions. Knowing about different practices and different notions of societal custom will make you a well-rounded person. It will be easier for you to accept and adapt to situations that are different from the one that you practice in your everyday life. Accepting the difference amongst cultures is one of the biggest lessons that traveling can give you. Discover new, beautiful and exciting places: The best part of traveling is finding new virgin locations in a remote countryside. Imagine finding a lagoon or secluded part of a beach, the joy of discovering a new place and the beauty of the site would be a moment that you will cherish for your life. Better understanding about yourself: We as individuals live in a pigeon cooped understanding of our existence. 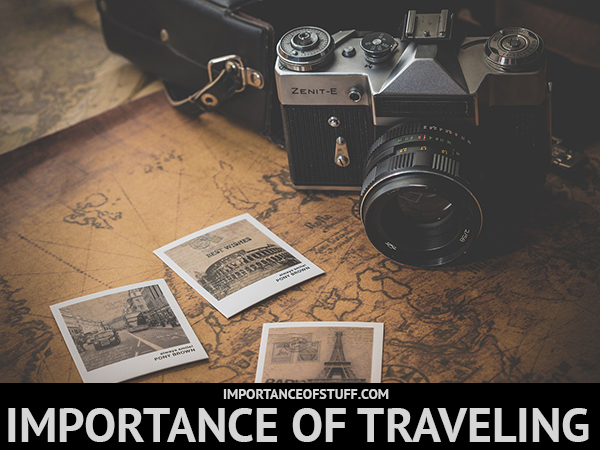 A traveler who has traveled many different places will come to meet a variety of people and will know about their likes and dislikes and would also need to communicate with them about his or her identity. The more different people we meet it helps us to know more about our self as through communication with them the traveler will understand how he or she relates to different people and how he or she handles emotions. Make new friends: Travel buddies are one of the most fantastic parts of traveling. Meeting other fellow travelers who share the same passion as you and loves to travel the world will not only give you a friend you can incessantly talk to about new places and new cultures but would also be a great partner for your next journey. These friends who are not a part of your everyday circle and do not come from the same locality as you grew up in, will bring a fresh perspective of how you look at life. The shared experience of cultures and upbringings with your travel buddy will make you see life and its teachings from a newer angle. For the love of food: Tasting multiplicity of cuisine is the bonus point for any traveler. A new place would mean new types of food that the locals swear by. Tasting locally cooked food and local delicacy is a must for a traveler as it will give you a better understanding of the people and will also teach you more about the local flora and fauna and their impact on livelihood as most of the items you eat will be locally produced. Unleash a skill you never knew you had: The challenges and opportunities you are to encounter in your travel spree will lead you to discover who you are deep down. It is only when you are far from home on some remote mountain climbing trip and cannot call for the services of a modern lifestyle that you realize the importance of cooking, washing, and cleaning after yourself. Your cushy life will never teach you this. Learn a new language: In some distant Chinese locality explaining to the waiter what exactly you wish to eat and the waiter bringing you that exact order has a thrill of its own. In your travel make it a point to pick up the local dialect or at least few words about it, not only will that make your trip easier but you will come back home with a new knowledge you can be proud of. The best education on life: No geography classes will give you a better understanding of the map than your travel guide book will provide. Traveling is adventurous, exciting, enlightening and a great stress buster. Seeing the world with your own very eyes will give you a better learning experience than any book can provide. I love traveling. I think it can change your total perspective of seeing the world. Travel and observe things, people, place, food, culture. This is the best experience you can have. Solo traveling is the best. Go on a vacation alone, you’ll enjoy it more. Try it once.